Insurance claims settlement in case of mysterious deaths. Recently, we lost a Star Bollywood Actress, Sridevi, at a very young age of 54 years. She was found dead in the bath tub of her hotel room in Dubai. Her sudden demise led to innumerable insensitive stories trying to solve mystery behind her death. We do not know the cause of her death and maybe we will never know. But death is natural phenomena. And unnatural deaths can happen to anyone. In insurance parlance, unnatural or mysterious death can be referred to as a sudden, unforeseen and involuntary event caused by external and visible means. Do You know, insurance claims for such mysterious deaths becomes very tricky? As you would know, life insurance benefits are paid to the beneficiaries when the insured has died. Often family members have to deal with a lot of administrative tasks along with dealing the emotional trauma. Most individuals worry about the lengthy, complicated claim settlement procedure. So we decided to share a few pointers and the list of documents required to settle claims for life insurance policies. 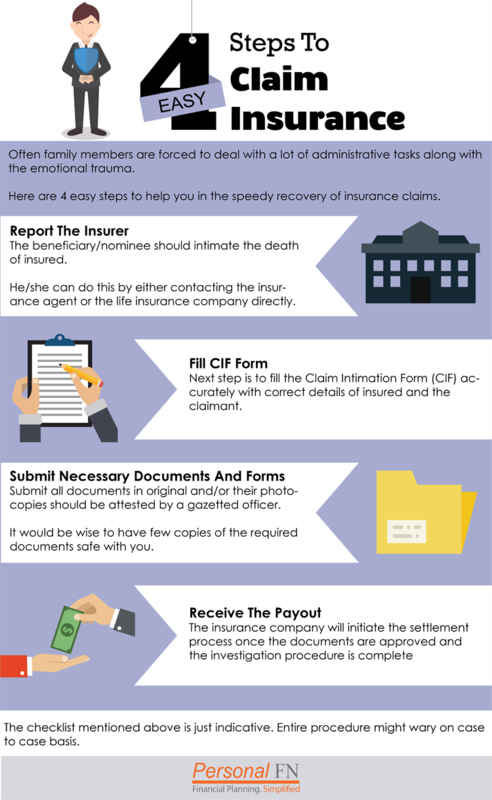 Here are some basic guidelines to help you in the speedy recovery of claims. Of course, the procedure would differ from one insurance company to another. So, to avoid delays, please read the policy terms carefully. Under a natural death scenario, the claims are settled without much investigations. But in case of death due to accident or unnatural death, the procedure for settlement might take a bit long. The assignee or the nominee should file for a death claim along with supporting documents with the insurance company. First step is to lodge a claim with the insurer and intimate them about the death of insured. The beneficiary/nominee can either contact the insurance agent or directly contact the life insurance company. You can report for death either via an email, on call or physically visiting the branch of the insurance company. At this step check for all the documents necessary to complete the claim settlement at earliest. Next step is to fill the Claim Intimation Form (CIF) of the respective insurer and attach the mandatory as well as supporting documents. These documents may vary from insurer to insurer, but the customer care centre or the support team, or your insurance agent can give you a precise list. Photograph of the 'claimant' must be affixed on the CIF along with signature/thumb impression across the photograph. All the policy numbers of the deceased person need to be mentioned, enabling complete and smooth processing of claim(s). The personal details of 'claimant', most importantly the address with pin code, telephone numbers, email id, and bank details; must be completely and correctly filled to enable timely correspondence. The address mentioned in the CIF must match the valid address proof, because all correspondences will be sent to the 'claimant' on the address mentioned. Ensure the bank details match the proof that's submitted. Select the mode of payment through which you'll like to receive the claim. Don't forget to signify it in the CIF. It is a mandatory requirement to further process the claim pay-out. The details of the 'insured' must be accurately filled. This gives an overview of the person insured at the proposal stage vis-a-vis at the time of claim. Complete details of the claim event are essential, as it provides a synopsis of the cause(s) that led to the claim. Past history, habits give the 'insurer' an overview about the health/medical state of the 'insured'. Hence, do ensure that all the details along with relevant medical records as supporting documentation to the claim are mentioned and annexed. The details of all a href="life insurance policies must be filled including other policies with the insurer. 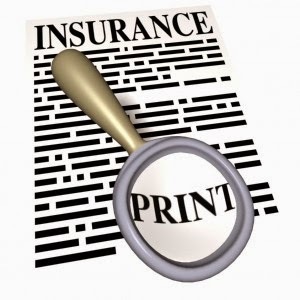 If the 'insured' had no other policies, mark it as Not Applicable (NA) or explicitly say, "No other policies". Authorisation & Declaration should be completely filled by the 'claimant'. In case you as the 'claimant' are signing in a vernacular language or marking a thumb impression, all details of witness and scribe are to be duly filled to enable the 'insurer' to communicate all claim correspondence. Collecting the documents and keeping them in order is an important step. Many times, we have observed in the past that claims are rejected/delayed due to incomplete paper work. Copy of Driving License if the Insured Person was driving the vehicle at the time of accident. All documents must be in original and/or photocopies should attested by a gazetted officer, SEM, magistrate or a person of local standing, e.g. Sarpanch, Talathi, Tahsildar, or Police Sub-Inspector. All medical reports, documents, and certification shall be issued by the attending physician and one who is qualified to provide such document/certification according to India legal code. Once the documents are approved and the investigation procedure is complete, the insurance company will initiate the settlement process. Usually the payout is paid through ECS directly into the Nominee’s account. Hence, appointing a legal heir is very important. Depending on the facts and circumstances of the claim, the life insurance company reserves the right to call for certain additional documents. Further it may conduct an independent investigation/inquiry to prove the authenticity of any claim where it is considered necessary. And may even reject the claim settlement for various reasons. As per the latest data published by IRDA (Insurance Regulatory Development Authority) out of the total 24 Insurance Companies, around 8 companies have Claim Settlement Ratio (CSR) of above 95%. CSR will help you assess the percentage of claims settled, against the total claims lodged with the insurer. So, if the CSR is 95% it means out of the 100 claims filed, 95 are settled and insurance proceeds are paid out. Incorrect or lack of accurate information is the most common reason for claim rejections. It is important to note that your honesty also pays - one should not mention any mendacious information while filling in the form and disclose all the relevant information pertaining to you and your family. You may escape the underwriter's eye at the initial stage of getting the policy, but this would back fire on you while settling your claims. Always disclose pre-existing disease/ medical condition (such as hypertension or diabetes) or habits such as, smoking/ drinking, etc. If the insurance company finds these hidden facts as the probable cause of death, then they have right to reject the claim. There are chances that your dependants may not receive the sum assured and the other policy benefits for which you have paid premium for years. Insurers settle the claims for active insurance policies only. Hence, ensure you pay your insurance premiums on time and do not miss them. If you do not pay your premiums, it results in a policy lapse. Now if your insurance policy has lapsed, then your nominee will have no legal proof to claim for the sum assured or the death benefits from the insurance company. A lot of times, insurers do not update nominee details. Most of us buy our insurance policy when we are young and appoint parents as our nominee. And we might forget to update the nominees in case of death of the earlier nominee appointed. Hence, you must always update the nominee details for faster and smoother claim settlement process. Often policy holders avoid taking medical tests necessary before buying insurance to avoid some nominal charges. It would be wise to take these tests and be sure about the pre-existing medical conditions. This may even help you to get covered for it and reduce the chance of rejection. Hence, always read your scheme related documents carefully. Be careful and ensure all the terms and conditions are clear before signing the policy document. As per the new policy guidelines issued by IRDA, insurance claims for suicides will be processed as per the product type. For instance, Market Linked Insurance Plan – In this case, then the nominee is entitled to receive 100% of the policy fund value, if the policyholder commits suicide even within 12 months of the commencement of the policy. And for Non-linked/ Traditional Life Insurance Plans - the nominee is entitled to receive 80% of the premium paid in case of death claim due to suicide even within 12 months from the commencement of the policy. Hence, no insurance claims would be paid to the dependents if the policy holder commits suicide within one year from the date of commencement. Earlier, the nominee was not necessarily the beneficiary of the policy and had to distribute the insurance claims of life insurance policies to all the legal heirs. However, the new Insurance Laws (Amendment) Act, 2015 addressed this efficaciously. There is a separate category now called 'beneficial nominee'. If you nominate someone as your beneficial nominee, such nominee, does not have to share insurance money with other legal heir. A policyholder can appoint multiple 'beneficial nominee' mentioning their share. It is also possible to appoint 'collector nominee' who will simply receive money from insurance company and facilitate the transmission to legal heir which may happen based on succession laws. Hence, nominee has a right to claim money even at maturity in case the insured person survived the term of insurance but died before claiming the maturity benefits. What's more, earlier, original nomination used to stand cancel on assignment of policy as collateral to a loan. However, new rules say that insurer will pay off the creditor first, but they will have to directly transfer the rest of the amount to the nominee appointed by the policyholder. Although the checklists mentioned above are guidelines, following them would help you handle claims in a hassle-free way. Always keep your family members or your loved ones informed. This will help them handle the claim settlement procedure, in case of an untoward event(s). Remember, involving your family while planning your personal finances can ensure their long-term financial wellbeing. Remember to appoint a nominee for each financial asset. It is wise to write a Will and store it in a secure place to avoid misunderstandings in the family. Also Keep your KYC details updated regularly with your insurer. Do not hesitate to contact us and we will be happy to solve all your doubt about personal finance, financial planning and mutual fund investing. You can get in touch with us at info@personalfn.com or simply call us at 022 6136 1200. How Staying Fit Can Reduce Your Health Insurance Premium? Does Your Insurance Policy Cover You From A Terrorist Attack?